Sometimes serious. Sometimes humorous. Always unpredictable. By Dan Pimentel - Welcome to the Airplanista Aviation Blog, where I take a lighthearted look at general and business aviation, the airlines, and the incredible and generous community of aviators called #Avgeeks...they are my aviation family. I am currently available for magazine and corporate writing assignments - Email me here. There can be no disputing the fact that avionics has been in a state of flux for a number of years, a forward push towards better technology that vastly improves safety and situational awareness. As the days click off this thing we call life, we watch as each new week brings us something for our panels with more whiz and bang than the stuff that was debuted last week. I have flown planes with Loran, and that distant cousin of GPS kept me out of trouble. I have flown planes with ADF, but that was in my primary training when it was just a puzzling and odd contraption taking up space on the panel. Of course everything I have ever flown had VORs, and I seem to collect older GPS units that can no longer be updated. Today's panel looks nothing like those back in 1996 when I got my license, and even my current ride – a 1964 Piper Cherokee 235B – has more "steam gauges" than the trains that used to visit Petticoat Junction. But in this pilot's flying "career", one thing is constant. 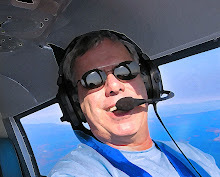 I have never touched a glass panel or any GPS aviation product made by Garmin. Despite this, I somehow fly my certified IFR bird around in and out of the clouds perfectly legal, and so far have always got where I was intending to go. "If you’re a light-jet pilot you’re very lucky, because Garmin just introduced the first touch-screen glass cockpit for Part 23 light turbine aircraft. You’ll have far fewer knobs to remember when using the G3000 system. There remain soft keys, buttons that are relabeled to fit the task at hand. iPhone users will feel right at home. The console-mounted touch screens control radio management, audio management, flight management, weather systems management, synoptics, and other vehicle systems. The simplistic user interface leverages the experience Garmin has gained by designing and delivering millions of automotive consumer products. As with the G1000, the G3000 has full reversionary capabilities, including in-flight dynamic restarts, so that all flight critical data can be transferred seamlessly to a single display for added safety during flight. 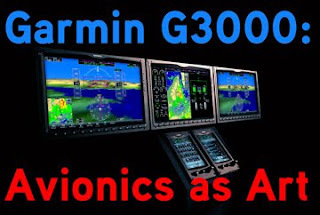 Garmin expects to receive G3000 technical standard orders (TSO) certification in the second half of 2011." It was bad enough when the Garmin 430s came out way back when and I could not afford them. Then Garmin upped the ante with the 530, and after that, added WAAS versions of each. I watched from the sidelines as Avidyne kept bringing bigger and badder panels to the avionics dogfight, and I was speechless as the G1000 panels arrived. So now, without ever even touching any of these "boxes", Garmin has added insult to injury with the G3000. I feel like a relic, yes, like a dinosaur, old and out of touch in the avionics race as I languish in the back of the pack behind my non-standard configuration of steam gauges. Would it be all right if I have them both?